The Onboarding App, developed by Infosys, helps streamline the onboarding process for an employee/new-joinee. The Onboarding App, developed by Infosys, helps streamline the onboarding process for an employee/new-joiner. The app digitalizes the onboarding process and facilitates real-time communication/support between the employer and employee through real-time onboarding status, queries, and guidance. Every organization conducts an onboarding process for seamlessly transitioning new candidates joining the organization to successful new hires. In most cases organizations use manual verification to check the documents submitted by the candidates. This significantly increases the time required to complete the onboarding process which makes the process less effective in terms of man-hours spent vs benefits achieved. In manual verification of documents there is no status indicator to track the number of candidates whose documents are pending, approved, or rejected and it also involves a cumbersome email communication process between employer and employee. 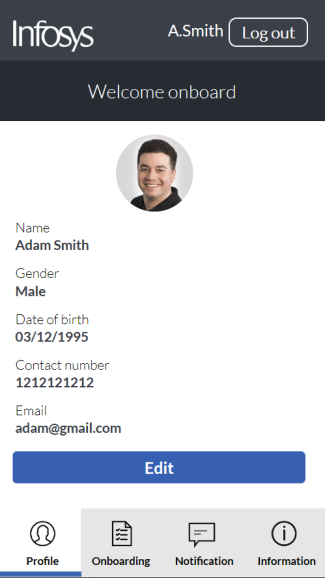 Hence it is imperative to have a simplified tool/mobile app through which an organization can effortlessly onboard a candidate using optimum resources in a limited time span. 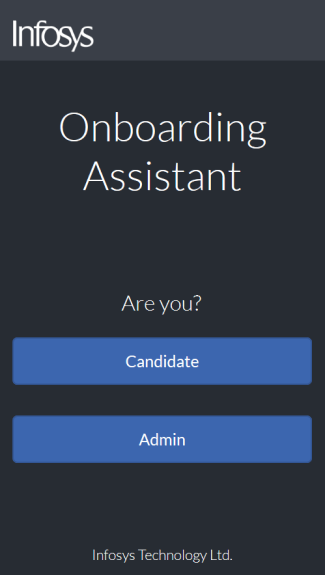 • Structured and efficient candidate onboarding process for businesses with a cloud-based centralized repository to upload a candidate’s documents, which can be easily verified by the onboarding officer. • The App reduces the margin for error, time. and cost required to verify a candidate’s onboarding documents by a significant margin. • Better onboarding process can increase retention by 25% and improve employee performance by 10-15%. • Reduced dependency on corporate hardware as the employee can use his/her device of choice to complete the onboarding process. • The onboarding officer does not require a candidate to be physically present, to verify his/her documents. 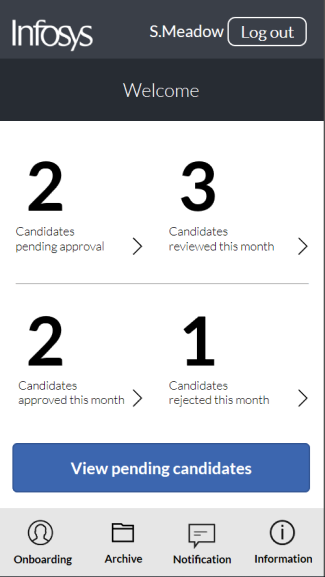 • Onboarding officer gets the ability check status of the candidates whose documents are pending or rejected by viewing the app’s admin dashboard. • Digitizing the onboarding process enables the onboarding officer to verify documents of more candidates in significantly less times and enhances the productivity of the onboarding officer. • Real-time notification to the employee on the onboarding status. 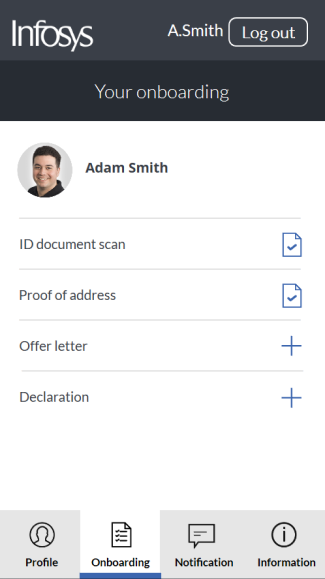 • Automated verification of documents. 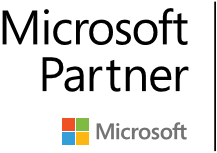 • Enabling collaboration among new joiners using Microsoft teams. • Facilities induction using the app.